Library service began in Davenport in 1839 with the creation of the Carey Library Association. A reading room was established in the Le Claire Hotel at the northeast corner of 2nd and Main Streets the following year. The next mention of any type of local library appears in the Davenport Gazette in 1853, announcing the opening of a reading room and circulating library in the Forrest Building at the corner of 4th and Brady Streets. The library association led a precarious existence and moved and reorganized a number of times. Finally becoming more self-sustaining, the renamed Young Men's Library Association leased the old Methodist Church Building at Fifth and Brady Streets. Control of the Association was entrusted to the women of the community. In July of 1877, Clarissa Cook (Mrs. Ebenezer Cook) offered to donate $10,000 for the construction of a library building, if a lot was purchased by the citizens of Davenport. The women of the Library Association successfully raised the funds needed and on November 7, 1877, the cornerstone of the Cook Memorial Building was laid at the corner of Sixth and Brady Streets. Despite having a new building and a collection of 7,000 volumes, and despite charging a fee to those who wished to take books out of the Library, the Library Association continued to have financial difficulty. Due to space limitations and the need for funds, it was decided to request a donation from Eastern industrialist Andrew Carnegie, who was just beginning his career in founding libraries. Miss Alice French (the author, Octave Thanet), a Davenport resident and personal friend of Carnegie, wrote to him asking for help. Carnegie believed strongly that public libraries should be funded by local citizens, so instead of simply giving money to assist the Association, Carnegie offered $50,000 to found a tax supported public library in Davenport--if the citizens of Davenport would support the library operations. At the April 1900 election, the citizens of Davenport voted in favor of a public library tax to support the Library. This was, perhaps coincidentally, also the first election held in Iowa in which women were allowed to vote. When it became evident the library building would cost more than $50,000, Carnegie increased his donation to $75,000. 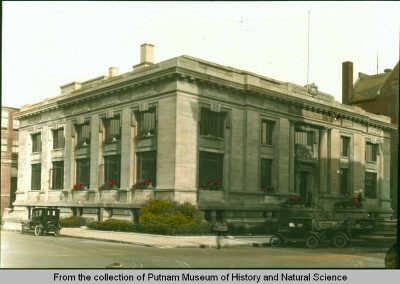 The Carnegie Library, built on the southeast corner of 4th and Main Streets, was dedicated and opened in 1904. It was the largest Carnegie Library west of the Mississippi at that time. For the next 60 years, library services were expanded to all parts of Davenport thru deposit collections in schools and storefronts and small branch libraries. By the 1960's, it was increasingly evident that the Carnegie Building was too small and inflexible for modern library services. One major need was a larger area dedicated to expanding children's services. A children's addition was completed in 1963, but during construction, the loose base sand float upon which the Carnegie building had been built was disturbed, resulting in cracked and displaced walls due to sinkage. Dangerously unstable, the Carnegie building was vacated and demolished in 1966. The library moved to temporary quarters in the former Hill's Department Store on the southeast corner of 2nd and Harrison Streets. Through the efforts of Library Board president C.D. Waterman, Jr., Edward Durrell Stone, the internationally known architect who had designed the Kennedy Center in Washington, DC, agreed to design the new library building. Stone's vision included a large open ground floor topped with a mezzanine and integrated the children's wing, which had not been demolished. The new Davenport Public Library building was dedicated and opened October 6, 1968. While some changes have been made in the interior layout, the library building continues to serve the ever-changing library needs of Davenport citizens. For many years, the Library had tiny branches in some area schools. In 1975, the City acquired the Annie Wittenmyer Complex, a Civil War-era series of buildings that had originally been the Iowa Soldiers Orphans Home. Later known as the Annie Wittenmyer Home, the facility had housed more than 12,000 orphans during its 115 years of operation, but closed in the 1970s. Some of the historic buildings in the Complex had been torn down and newer buildings built, but after it became City property, efforts were made to get the remaining buildings on the Historic Register. In 1977, the City offered the Library the opportunity to temporarily put a branch library in the main Complex building, in the rooms which had once served as the kitchen and dining room. The Library opened the new 4,200 square foot Annie Wittenmyer Branch on April 3, 1978. This facility was designed to hold approximately 20,000 books, along with seating and program space. By the mid-1980s, the city of Davenport was steadily growing, both to the west and to the north. It was decided that the aging Annie Wittenmyer Branch, located only 3 miles from the central, downtown library, no longer functioned well and needed to be replaced with branches in the areas of the city that were expanding. A site chosen in 1992 and a library plan developed, but a variety of obstacles cropped up causing delays and repeated relocating. Finally, in 2001, the newly-elected mayor and city council identified the construction of new library branches as a high priority. A new location was selected for the first branch and land was purchased. In November 2003, the voters chose to approve an operational levy to provide funding to run two new branches. Ground was broken at 3000 N. Fairmount Street for the first branch. The Annie Wittenmyer Branch was closed for good in November of 2005, and its collections transferred to the new Fairmount Branch, which officially opened in January of 2006.